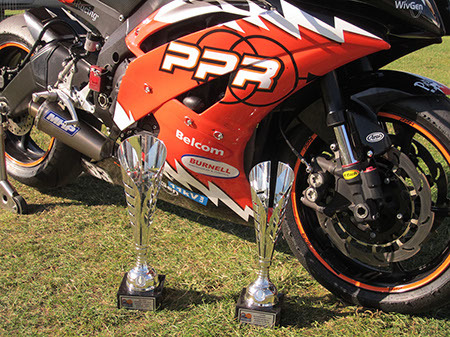 Power Projects Racing - Archived Nov 2013 | Belcom Cables Ltd.
Apart from being a business venture we intend to bring the fun back to our racing; we all get on very well, we have a great rider with massive potential in Tommy and an experienced enthusiastic team of mechanics and support staff who have been working together for many years.Our race team also includes a number of young engineers working towards degrees in mechanical engineering and motor sport engineering and we are hoping that exposure to our race team will help their careers. The final round of 2013! It came round quick but we were ready for it. It was nice to be heading into the race weekend with a really strong base setting on the R6. FP 1 was wet and as the bad weather looked settled for the weekend it was the ideal time to get a wet set up. As soon I the session started I left pitlane and started to get to grips with a wet Brands Hatch, grip seemed very good except the usual places such as the exit of druids and graham hill. I felt confident but didn’t really push on as it was only FP1. I ended the session in 9th place and 1st in the cup. FP2 was dry which was a surprise! We started on the settings we used here from round 7 and the bike was working perfectly unfortunately the bike was just down on grunt as we couldn’t get certain parts In time although the session went really well it was slightly frustrating due to grunt issue but as a racer your never really happy unless your first and even then you want to go quicker. Qualifying Saturday morning was soaking wet and I got out on track and started to set my own rhythm I managed to do a full race distance (18 laps) as I wanted to get a feeling for the wets after that many laps. I started to follow Easton and was happy with my pace but in the crucial few minutes of the session I struggled to string all my sectors together due to traffic but was confident for the race. I ended up in 20th and 6th in the cup 0.5 off pole. Saturdays sprint race was wet but there was a very small dry line appearing by the end around clearways and paddock hill but it was still wet enough for the wet tyres. I got off to a decent start and was mid pack after a few laps I started to feel really confident and got into my own groove and was now up to 3rd in the cup and 15th overall however I had 8 seconds of empty track ahead to Newstead in 2nd with 5 laps to go I got my head down and just started to string the laps together I was closing the gap rapidly and as we started the last lap I was 3 seconds back of Newstead and Stapleford, I wasn’t giving up and as we went onto the GP track I was on the back Wheel of Newstead I managed to pass him at Sterlings and had a go a Stapleford but was out dragged to line. I was really happy with how the race went finishing 2nd in the cup and 14th overall was really good. Also the lap times were good and I would not start race 2 from 13th position. Sunday warm up was wet again and after a really good race yesterday I managed to continue the pace into warm finishing 8th overall I was now ready for the race. The conditions for the race was horrible it was now drying, I made the tyre choice of an intermediate rear and dry front and put all my wet settings in the bike, I nearly launched myself out of the seat on the warm up so my confidence in my tyre choice was already knocked the race got underway and on the first lap was stopped due to rain. In pit lane I made the choice to go out on full wets for the restart as it was declared a wet race and another downpour was looking likely. The race got underway and I was now on wets with wet settings on a dry track, I was expecting loads of grip in the early stages and planning on putting a gap into the rest of the cup runners but the plan didn’t pay off on the first lap I lost the front twice and the wet where already overheating, the bars were walk all over the place down the straight the bike was starting to become extremely hard to handle and I was struggling to meet apex’s but was up to 3rd in the cup and praying for a downpour. I think my tyre choice was over exaggerated by the wet settings in the bike and as I tipped into Surtee’s I lost the front on lap 8 and was now out of the race I was gutted and just to top it off before I had even stopped sliding the downpour I had been praying for happened! Overall we had a good weekend and I feel like in the second half of the season the team and I have made some really strong progress with the bike. 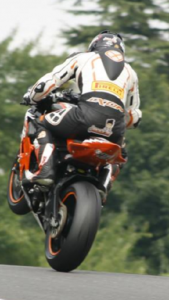 I’m looking forward to getting back out on a bike soon and can’t wait for 2014 already. 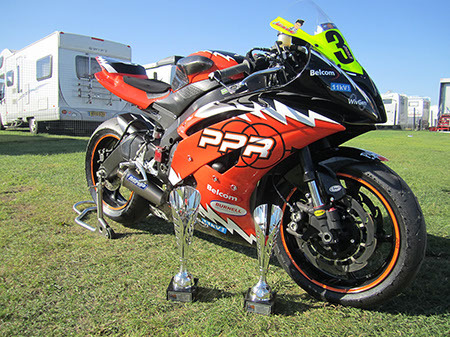 I would like to thank Power Projects Racing and all my sponsors Belcom, 11kV LTD, Burnell controls, Green Day Generation, WivGen, Power2Connect and Daytona Boots and Knox armour. A massive thanks to Dan, Al and Andy Hopkins, James Jackson, Sam Palmer and Phil Seton for their help repairing and setting up the bike. After an excellent first weekend in the supersport class at Cadwell Park we headed off to round 9 at Donington Park with the new EVO engine in the bike. Friday was a washout the rain did not stop pouring from the early hours all the way until late afternoon. This meant both free practice sessions would be wet which would ruin our plans to find a set up and learn about the new engine characteristics. The first free practice session got underway and I settled into a rhythm being careful as the track and air temperature was low and with the heavy rain this was not a good combination. I finished the session in 12th position and 2nd in the cup but was confident we could go a lot faster, we also had some issues with the quick shifter to solve. For the second free practice conditions got worse with standing water in most places on the track, this made it difficult to generate any heat in the tyres and after the red flag came out ten minutes into the session due to fuel being split on the track I made the decision to not go back out. I finished the session 3nd in the cup and 16th overall. Qualifying was dry and I got out of pit lane behind Mackenzie and was happy using him as a target we just started to build up for fast laps when the session was stopped due to a crash. The session then restarted and I managed a time of 1.35.5 on my first lap out of the pit. I was then on another personal best by 0.4 through the first sector when I lost the front at Craner Curves which was at around 120mph, I tucked my arms in and rolled through the gravel but was ok just slightly disappointed as I had not changed anything from the lap before. I was still 2nd in the cup and 16th on the grid. Race one got underway and the team worked extremely hard to get the bike back on track. I managed to push to the front of the supersport cup class and was now leading by around 2 seconds and was hunting down the battle for the points when the clutch started to slip unfortunately the problem got worse and I had to pit but got back out on track after a quick adjustment in the pits. Warm up went well and I was only a few tenths of my qualifying time and the bike felt strong for the 18 lap race in the afternoon. The warm up lap got underway and I hit a problem the quick shifter was playing up and gear changes was being delayed the bike then cleared itself for the second half of the warm up lap. As the lights went out I pushed the leaver into second with my foot and the quick shifter got stuck and I was now stuck in gear with the bike changing for me. I reverted back to not using the shifter but was now last I started to come back through the field when all of a sudden the gear lever was jam solid and stuck down so I couldn’t change gear and unfortunley had to retire on lap 5. Although the weekend was tough after such a good Cadwell round, we are still developing a new engine in the bike and made big steps forward. Round eight was at Cadwell Park and I was looking forward to getting out with the supersport boys for the first time. As we set off we only managed to get around half a mile down the road before the race lorry managed to blow up (which would have been stuck down a country lane if it wasn’t for Mike and his JCB). This bad news was followed by even more devastating news when we had a phone call to say the new EVO engine had also blown up on the dyno. However we didn’t give up and was determined to get to Cadwell and hired a van to get there. We was now on your way but with no bike! The team worked extremely hard and spent the whole of Friday night and Saturday morning putting a standard engine back into the bike which we would have to run in the supersport class. Free practice one was wet and the bike and the bike felt really good I have a really nice wet set up which gives me good feedback and I was able to set a good pace by myself I ended the session in 10th place overall and 1st in the cup 2 seconds clear of 2nd. The track dried up for the second practice session and we had some work to do as the bike had some suspension and gearing problems in the last sector of the track. I was now also starting to struggle slightly on punch out of the corners and straight line speed as the stock engine was no match for any supersport motor. I ended the session in 22nd place and 4th in the cup with a time of 133.197. Qualifying cam round on Sunday morning and although the track was dry the weather looked threating and the mist came in (typical morning at Cadwell Park). The suspension was slightly better but still not 100% and we changed gearing mid session which didn’t work but we now knew what needed to be done after looking at the data logger with Dan, Mark and Kev. I did manage to go faster with a time of 1.32.561. (4th in cup 22nd overall). It was also nice not to hit any traffic in qualifying it’s been a long time since I have seen that much clear track, I nearly forgot what to do! Race one was 12 laps and I got off to a really good start managing to get infront of a few supersport riders however where I was lacking punch from the corners and top end speed this was causing me serious problems in the race and I was being put out of my rhythm by the bikes I was stuck behind I started to get frustrated as the group infront started to pull away but kept calm and came home in 23rd place but finished 3rd in the Supersport cup race which I was over the moon with, finally a podium for the team! Warm up went really well and we had ironed out the problems we was having with set up I finished warm up in 18th place with a time that was only 0.2 off my qualifying time on worn tyres. The race got underway and I knew I had to be aggressive on the first lap to get past some supersport bikes so I wasn’t held up. I cracked the start again and jumped from 22nd on the grid to 18th on the first lap. I got my head down and was 2nd in the cup I consistently started to hit 1.32 laps and was now in a battle with Dean Hipwell on lap 6 I was passed by Hipwell but was unable to stay on the back of the supersport bike. I knew the race was long (16 laps) and the pit board started to increase the gap was now at 6.5 seconds to the next rider and I just had to bring the bike home in the last few laps. I crossed the line in 16th place and 2nd overall. I was really pleased with the result especially on a stock engine doing my fastest time of 1.32.333 (2nd fastest stock 600 of the weekend). I tried to save Kev and Lynn some champagne but Dan got thirsty walking up the hill! I would just like to thank the whole of Power Projects racing for their support. Dan, Al and Andy Hopkins, Mark Hill and Sam Palmer for setting the bike up the weekend once again it was perfect. A massive thanks to Belcom, 11kV LTD, Burnell controls, Green Day Generation, WivGen, Power2Connect and Daytona Boots and Knox armour and Phil seton for letting us in the awning the weekend. 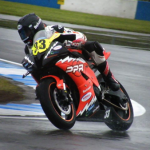 Really looking forward to the next round at Donington Park. 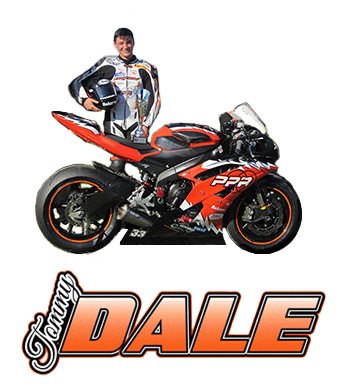 Power Projects Racing and Tommy Dale have become the first team to step up to the Motorpoint British Supersport Class for the remainder of the 2013 season, running to the draft 2014 Supersport EVO regulations that were recently announced at Oulton Park. 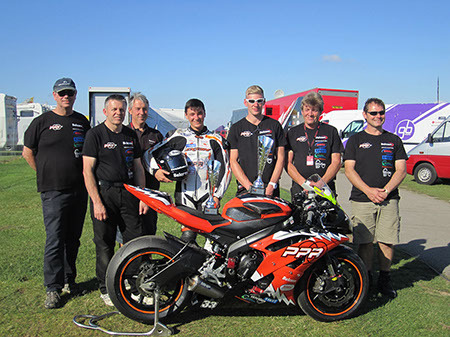 The team are aiming to gain the early advantage for a season long campaign in the class next year after finishing third in the Triumph Triple Challenge in 2011 and most recently several point scoring finishes in the Pirelli National Superstock 600 class. Round three was at Oulton Park, and I was feeling confident going into this around even after the off at Thruxton. The typical British kicked back in and free practice was wet, the session got underway and we did two easy laps on the bike to make sure the new engine was all ok. I came into pit lane so Dan could do all the checks on the bike and then got back out on track but the session was red flagged by a crash so we returned to the pits. They restarted the session but again but some riders fell and the session was then scrapped, meaning we only got two laps in free practice. It dried up for qualifying and we put in a base setting in the bike as we had no data for Oulton Park and this was my first time back here for two years! The Plan for qualifying was to put as many laps in as possible and come in if any changes were necessary. I completely forgot how demanding this place was and how much time the front wheel spends in the air at 140mph!! Which was just a little scary at times. I started to get faster and faster latching onto a group in front using them as my target. I made good ground and adjusted my style on the bike such as short-shifting in places to keep the front wheel down. I was now 9 laps into qualifying and in 5th place. I found some clear track I went for a lap which was really quick in sector 1 but unfortunately lost the front end as I entered shell oil’s hairpin the rest is a blur as I was knocked out and taken to the medical (which I’m not quite sure how I arrived at). I ended the session in 10th place but was declared un-fit to ride for the rest of the weekend by the medical staff. After analysing the crash in the past few days, I think I have bottomed the forks out going into the hairpin as this was a lot faster than any of the previous laps I had completed. I would like to thank Dan, Al and Andy for all the efforts to get the bike working and all the sponsors for their support and belief in me: Belcom, Burnell controls, 11kV LTD, WivGen, Power2Connect and Green Day Generations. 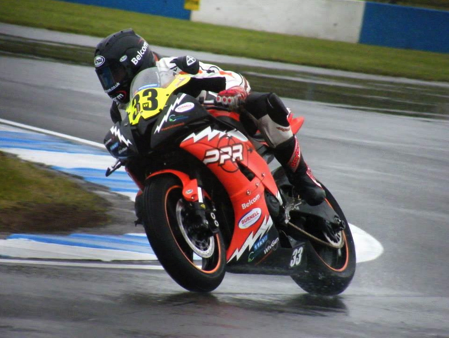 The next round is at world superbikes Donington park, where we will get two races so I can’t wait to be back on the bike. In qualifying 2, held in torrential rain, Tommy managed a very safe 2nd place but overall his dry time put him 3rd on the Grid. Going into the esses at about lap 12 of 14 the train of riders in front of Tom all breaked and Tommy had nowhere to run. Falling onto the left hand side the bike flipped and rose majestically into the air right in front of the team sponsors and guests. The bike seemed to hang in the air for ages as I hoped it would float down and not cost us any thing. Good News: the bike is not too badly damaged despite landing on front wheel, back wheel, and top. even so its at least £2k repair bill. Remind me why we go racing please… oh yes its for days when we get 3rd on the grid in a team that’s only 3 months old, had two races and is learning fast. 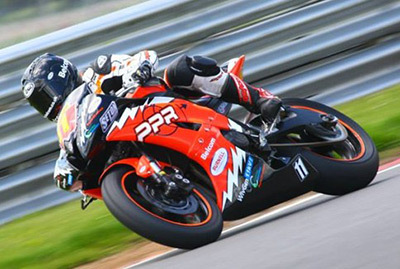 After having only three days to turn everything around we headed down to Thruxton, the fastest race track on the calendar, for round two of the Superstock 600 championship. Free practice was wet so it was a case of feeling my way around the wet tarmac. I finished the session in 13th but was very confident and happy with the wet set-up we had. The weather brightened up for qualifying one and we got underway. I found some clear track early on which is very rare in this class. So I got my head down and pushed on managing to string together a consistent five laps bumping me up to 7th on the grid. I crossed the line and knew the lap time I did was much faster than before. I ended up in 3rd position. The rain started to come down hard whilst out on track but the bike was on rails. 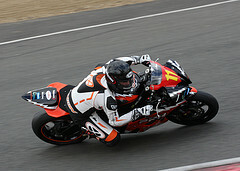 I felt very comfortable on the bike and started to put in some good lap times. I put together an 11 lap stint but came in as the track condition started to deteriorate. Standing water made it very dangerous in the fast sections and the session was then red flagged. We ended up 2nd in the session but would start 3rd in the race. Race day came round and the lights went out. The start was better than the one I had at Brands Hatch a week earlier but still wasn’t ideal and I had to fight my way through to finish lap one in 8th. There was a problem as the wind direction had changed and the bike was now under-geared for the fast corners, back straight and slipstream. I was eaten up down the back straight a few times after the safety car had gone in and found myself down in 14th place. I started to get into a groove and closed in on the group in front as we entered the chicane the pace seem to slow up and I had nowhere to go. I clipped the back of the rider ahead and down I went. I was really disappointed about the mistake and can only apologise to the rider I clipped. Once again I would like to thank the whole team for the efforts this weekend (Dan, Al, Andy, Jo) all my sponsors Belcom, Burnell Controls, 11kV Ltd, WivGen, Power2Connect and Green Day Generation. 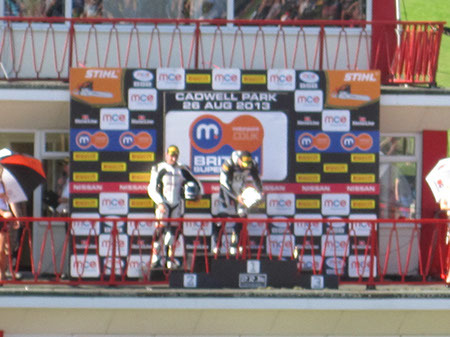 Also thanks to Daytona Boots, Knox Amour and Arai helmets for keeping me in one piece after my off. I’m looking forward to getting back out on track at Oulton Park. Although starting from second row Tommy’s first racing start on a 4 Cylinder bike was poor and he ended lap one in about 20th Position. Finally ending up in 14th position after a lot of “elbow” and at the back of a train of riders up to 5th place. We are buying a new clutch and going to a runway where Tommy will practice starts. 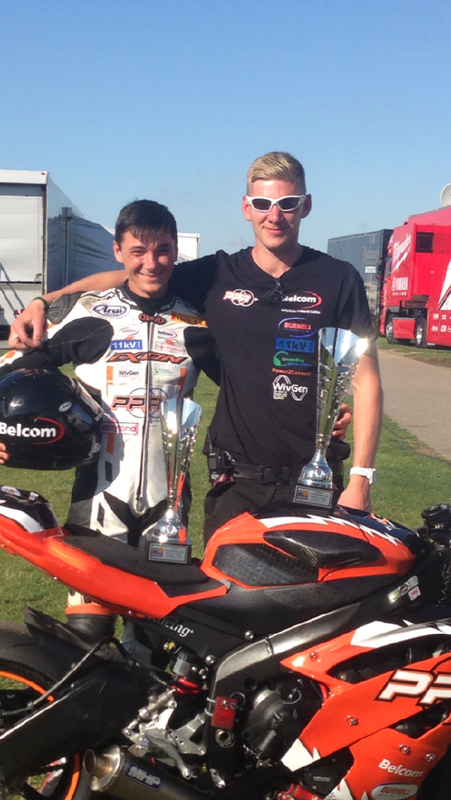 Great set up for Power Projects Racing, a real fun weekend and a great team with good potential.